This is one of my absolute favorite meals. Like…since I was a kid. My mom (Mrs. 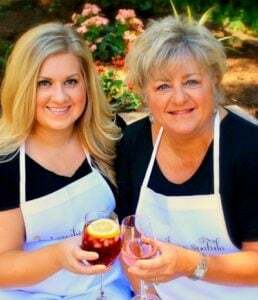 Laughing Spatula…Elder Spatula…The Fabulous Kathi Spatula…The patriarch of this very site!) 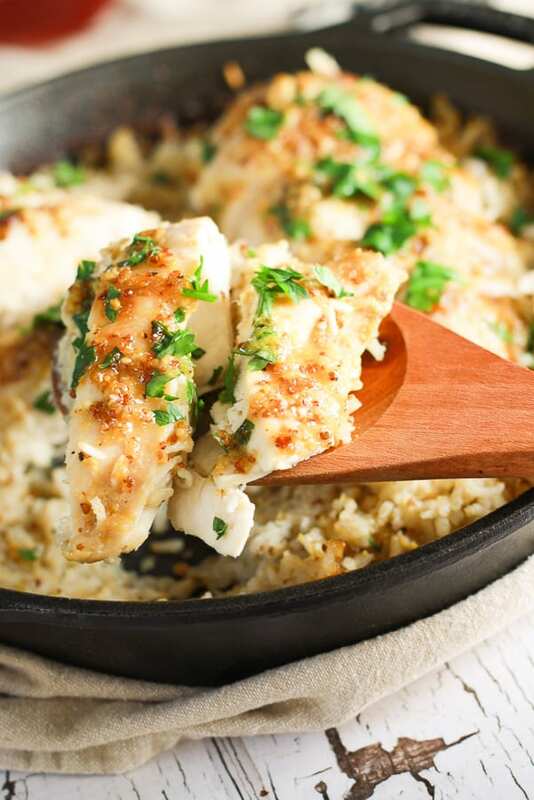 has been making this my entire life and why this Baked Honey Mustard Chicken and Rice isn’t already on our site is beyond me. It is just SO good, and it is a REAL one pan meal! So what’s for dinner? Baked Honey Mustard Chicken and Rice it is! Sprinkle with some parsley, fluff your rice, and you’re good to go! This recipe is THE easiest and I promise your family will love it. I use THIS cast iron pan from Lodge- It’s only $14.00 on Amazon- and if you don’t have one, BUY ONE. It is a total kitchen staple and everybody needs one. Now- if you ARE going to use cast iron, especially with a starch (like in this recipe- rice) make sure you season it well. Lodge actually sells seasoning spray (click here to check it out), but I just use olive oil. Dearest readers- season your cast iron pans- you have been warned! If you want more facts about using cast iron- check out this ‘how to’ from my friend Rachel at Feast & Farm. She brings up a good point that it’s important to remember that when using cast iron, the ENTIRE pan gets hot (even if you’re just using it on the stove), so be careful! The key to Flavortown is this broth mixture! SO good! The only thing that’s missing as far as ingredients and the above picture goes is the chicken. This is it, people! You’re SO close to having a delicious, one pan family meal. I use whole grain mustard because I like the grains- but you can use dijon if you’d rather, no big. 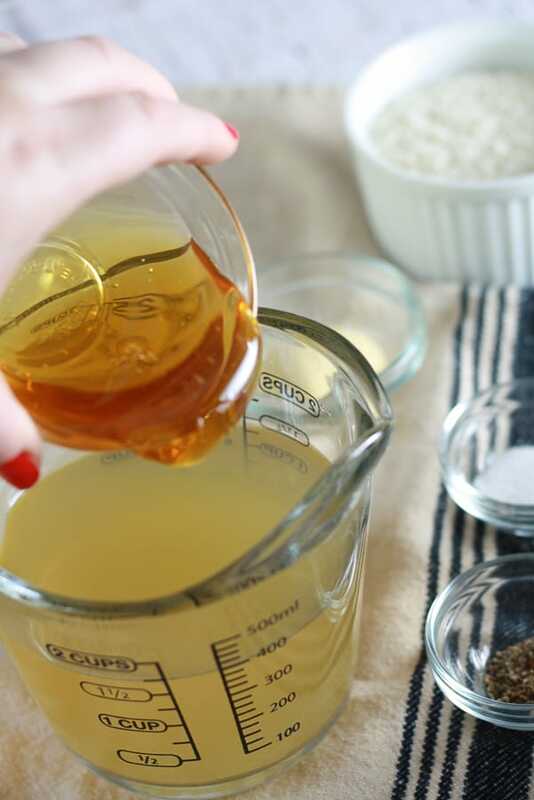 Mix up your honey mustard broth mixture, pour it over your rice, THEN add your chicken breasts on top. P.S. Can we talk about that glorious glob of honey? I am a bit of a honey fiend. I love the stuff. 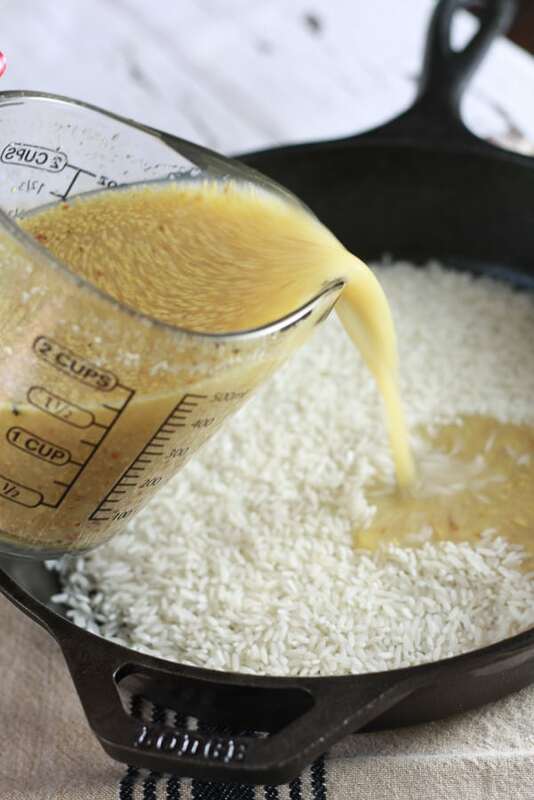 Pour your broth mixture onto your rice, THEN add your chicken to make sure the rice cooks all the way. Pour your broth, stir, and then place chicken breasts on top. Place your chicken breasts on top of the rice and liquid mixture, cover with foil, and bake. Add some salt and pepper to your chicken, cover with foil, and bake for 35 minutes. While this is baking, mix up some additional honey mustard mixture (mustard + honey + salt + pepper), slather it on top of your chicken, remove foil, and bake again for an additional 20 minutes (or 30 depending on the pan you’re using). Halfway done Baked Honey Mustard Chicken and Rice. Add additional sauce, and continue to bake. Almost there! See how that sticky honey mustard mixture sticks to our chicken? That is some special kind of deliciousness. Slice it up into 1/2 inch sections and serve. 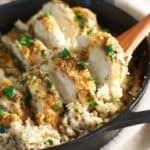 Once your rice is fully baked, fluff it with a fork- You’ll want to lift up the chicken breast (that sounds like a motivational sentence from the chicken breast olympics- “Lift up that chicken breast!”), fluff the rice, including the rice that was under your chicken, slice your chicken if desired, and serve. I sprinkled mine with parsley because it makes my pictures prettier, but I have found that I do really enjoy the taste of parsley as well. …And that my friends- is how you do baked honey mustard chicken and rice. 🙂 This recipe tastes like home to me, and I love it! I’m going to go hug my mommy now. If you try it, upload a pic to instagram and tag us with either @laughingspatula or #laughingspatula. Nothing would make me happier than to know you’re enjoying this one pan meal as much as I do! Do you need other great recipes? Check out our FAMOUS Pesto Mozzarella and Tomato stuffed chicken! We also love anything that’s simple and tasty, like this Roasted Lemon Chicken with Potatoes and Rosemary. If you’re heavy on honey- check out this Baked Honey Garlic chicken- this one is a show stopper and a FAVORITE of our family. If you don’t have whole grain mustard, use regular dijon! You probably could use yellow mustard if you’re in a pinch as well, but be warned- it will be bright. Check out my tips above if you’re using a cast iron pan. They take a bit of extra work but they’re so worth it in my opinion! To sub brown rice, increase liquid by 1/4 cup and after 25-30 minutes, when chicken is cooked through, remove it and continue to cook rice another 15 minutes until soft. If you don’t have powdered garlic, try regular garlic! It would be delish. Just mince it well so it disperses throughout the rice. To make this successfully, don’t skip the ceremonial lifting of the chicken breast (lol) when you pull it out of the oven the first time. It’s important the liquid gets around to all of the rice so it cooks evenly. 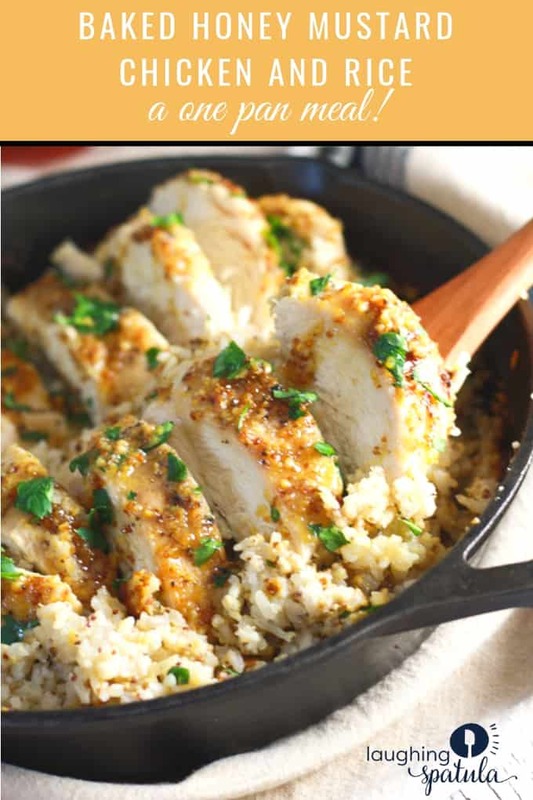 Check out this video to help make your Honey Mustard Chicken and Rice foolproof! 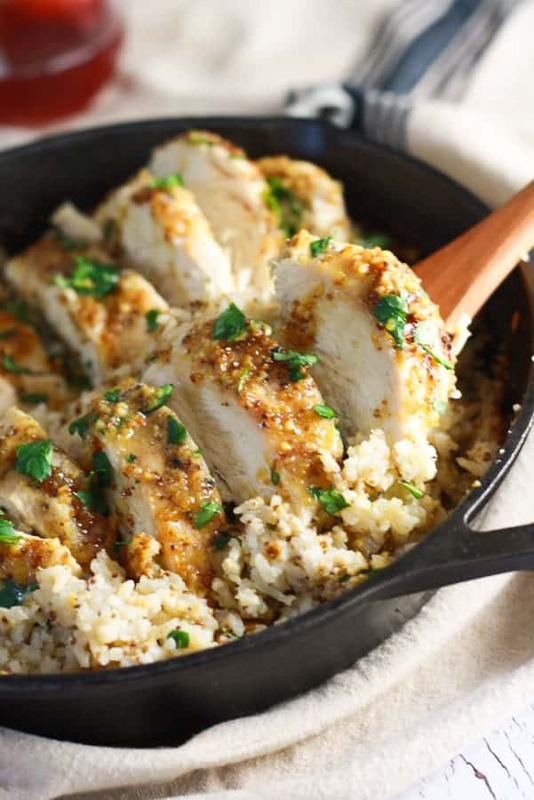 A delicious one pan meal that comes together in a pinch! Preheat oven to 375 degrees Fahrenheit. Spray shallow baking dish (9x9) or cast iron pan with non stick spray. 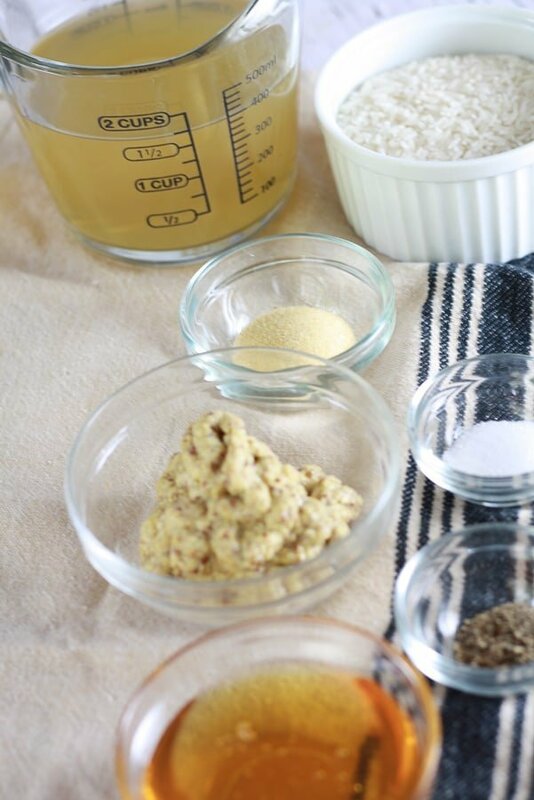 In a large bowl or 2 cup measuring cup, combine chicken broth, honey, mustard, and powdered garlic. Mix well, ensuring honey is combined into mixture and is not sticking to bottom. Pour white rice into prepared pan or cast iron pan. Pour broth mixture over rice and stir. Place chicken breasts on top of rice and broth mixture. Sprinkle chicken breasts with salt and pepper. Cover with foil, and bake for 35 minutes. 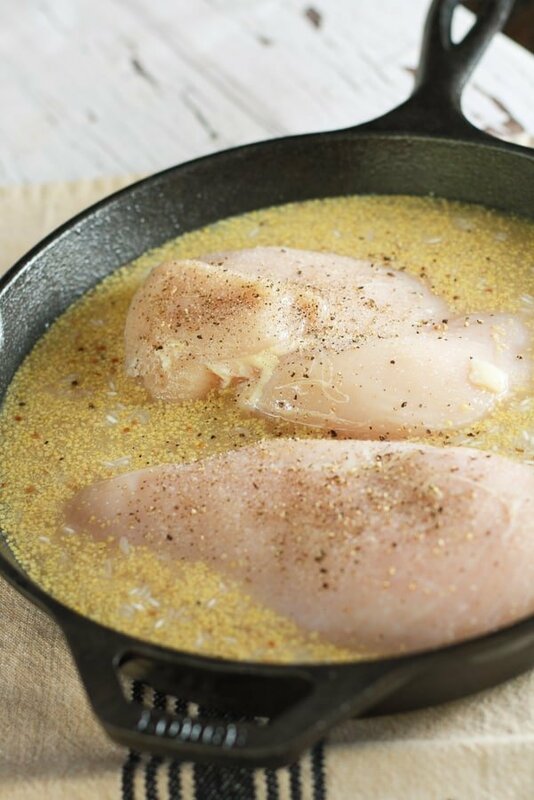 Remove from oven, remove foil, and lift chicken breasts ensuring liquid is dispersed throughout pan. 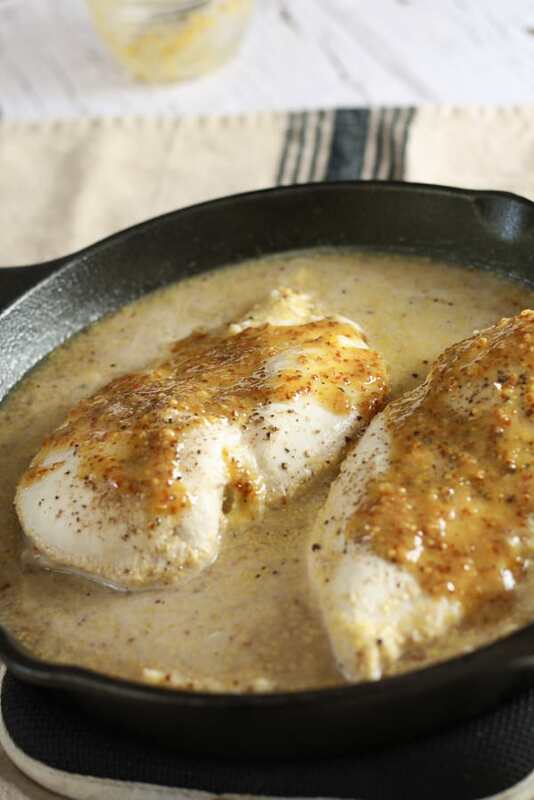 Coat chicken breasts with additional honey mustard mixture. Place pan (without foil) back in oven to bake for 10-15 minutes, or until rice is tender. If you don't have whole grain mustard, use regular dijon! You probably could use yellow mustard if you're in a pinch as well, but be warned- it will be bright. Check out my tips above if you're using a cast iron pan. They take a bit of extra work but they're so worth it in my opinion! I have not tried brown rice with this, but it does take longer to cook. If you are hell bent on using brown rice, add in another 1/4 cup of chicken broth to your broth mixture. If you don't have powdered garlic, try regular garlic! It would be delish. Just mince it well so it disperses throughout the rice. To make this successfully, don't skip the ceremonial lifting of the chicken breast (lol) when you pull it out of the oven the first time. It's important the liquid gets around to all of the rice so it cooks evenly. This recipe is so tasty. I’ve prepared it several times. One time I had some spare rice leftover from another meal I just skipped putting rice in casserole dish and just ladled chicken and sauce into precooked rice. I made this last night and it was fantastic! Thank you for yet another great supper! Thank you for the nice note Elizabeth! We are so glad you liked it! Will it work if you put it in a regular pan and not a cast iron skillet? Yes! Any casserole or baking oven proof dish will work! This looks so simple and delicious! Cannot wait to make this at home. The next time I head to the grocery store I am definitely going to swoop the ingredients to make this! Hopefully it turns out as well as yours! I think I will try this using bone-in chicken breasts. I just got a killer deal on them and have been looking for good ideas how to use them. This looks SO good -and my family loves honey mustard!! Sounds yummy, and I’m loving the whole grain Dijon mustard w/chicken. It’s e-z to prepare, and I’m sure we’ll all love it. I’ll use low sodium broth, and add a bit more broth, ’cause I like to use brown rice. I’ll cook it all about 10 min. longer, in order to accommodate the additional cooking time for brown rice. What a lovely yet simple dish! I too, wonder why it was never posted on “Laughing Spatula”. Oh well, we have it now! You’re right Rachel, there’s nothing like using a cast iron skillet. I’m presently the ‘caretaker’ of my great grandmother’s old “Lodge” cast iron skillet, which is about 80 yrs. old. I know that many delicious meals were made in that skillet, and it will be passed down to my son (who is a chef). Thanks for this recipe, Rachel. BTW, your photos are beautiful!